Grech, An. Xuereb (K. Grima), D. Mercieca, L.A. De Melo Lima, K. Mercieca, Al. Xuereb, A. Oularbi, J.G. Vella, D. Hili, M.A. Morgon Filho, J.J. Sandobal Guarin. Parnis, J. Pace, J. Bajada, K. Farrugia, D. Sowatey, F. Apap, C. Mercieca, E. Lattes, C. Camilleri, E. Da Silva, G. D.L. Galder. 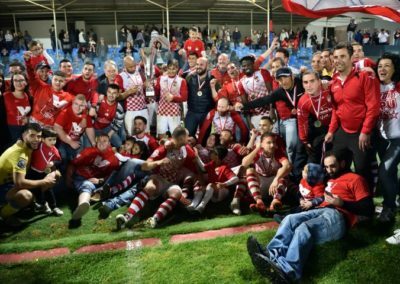 Victoria Hotspurs, who were already mathematically champions of the BOV Gozo Football League Division I confirmed their excellent moment of form during the second half of the football season by winning the GFA KO completion for the first division. 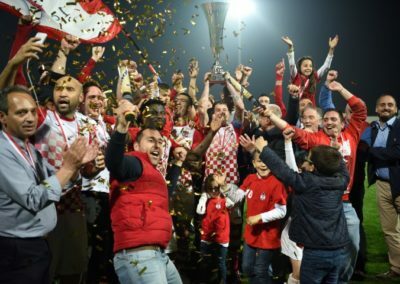 The Hotspurs lifted the trophy for the first time in their club history with a victory over Ghajnsielem. 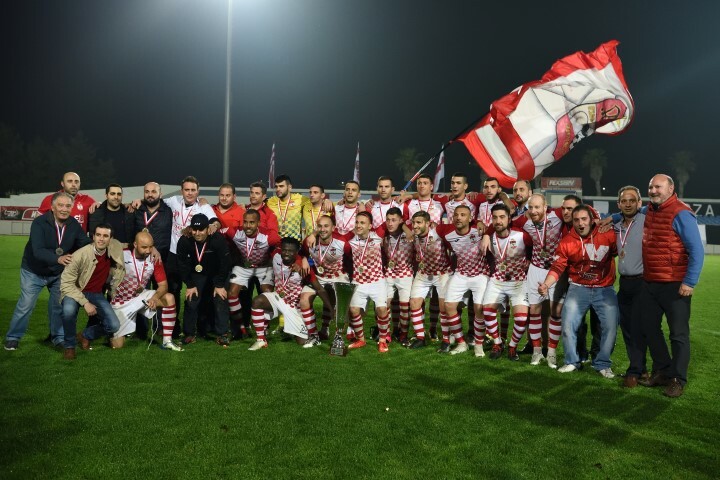 The Blacks were contesting the second final of the season as they were finalists in the Super Cup in the match that opened the 2017/2018 football season in Gozo, a final which they lost at the expense of Xewkija Tigers. 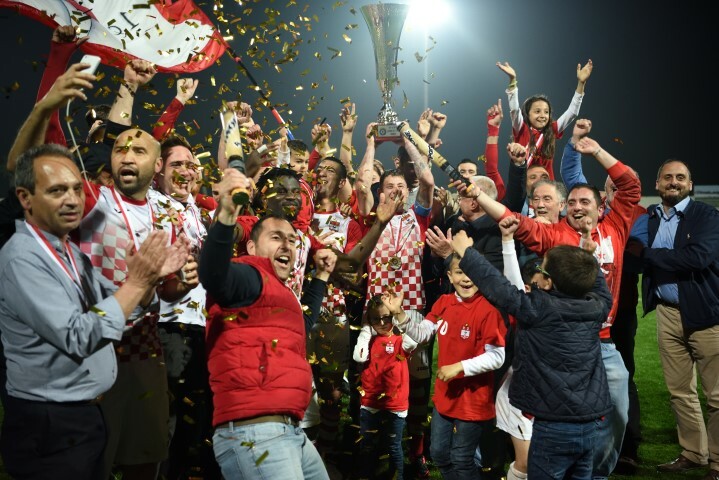 The two sides had good reasons to aim for the honour as the Hotspurs needed to add another trophy to compliment a very successful run during this season while the blacks were aiming to make up for some disappointment in the championship by winning an important honour. As a result the match turned out into an interesting match where Ghajnsielem ended the first half with a one-goal lead but the Hotspurs turned the result in their favour with two goals that arrived midway through the second period. The match lived up to the expectations as the outcome remained uncertain until the final stages. Ghajnsielem had a good reaction during the last part of the encounter in an attempt to force extra time but the Hotspurs scored a third goal minutes from the end of the match which led to protests by Ghajnsielem’s players who also had a player sent off. The two sides came out determined to take command of ply and both sides produced some very good scoring opportunities. In the fourth minute of play Victoria’s Elton Da Silva entered the area with a personal action but had his shot partially saved by goalie Joseph Grech. Jonathan Bajada took the ball from the rebound but his shot ended away from Ghajnsielem’s goal. Two minutes later Ghajnsielem were awarded a penalty for a foul by Daniel Sowatey on Luis Andre De Melo Lima but Ghajnsielem’s Joseph George Vella had his shot from the spot kick that was partially saved by goalie Adrian Parnis. Ali Oularbi headed in goal from the rebound but the goal was disallowed as Oularbi was inside the area before the penalty kick. 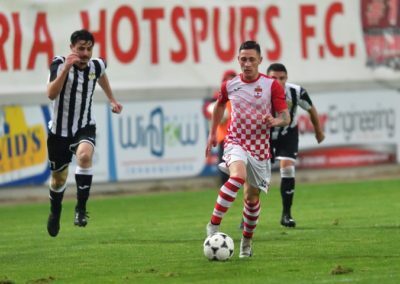 The Hotspurs tried to produce a reaction after the scare and in the following minutes they produced some pressure on Ghajnsielem’s rear guard. 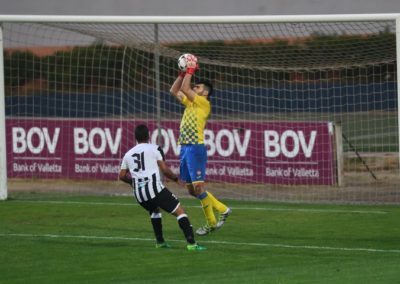 On 10 minutes a shot by Elton Da Silva was saved to a corner by goalie Joseph Grech and five minutes later another attempt by Victoria’s Da Silva was blocked by Ghajnsielem’s keeper. From the same action Ghajnsielem’s Ali Oularbi tried to pass back to the goalkeeper but the ball arrived to an unmarked Elton Da Silva who had his shot form an ideal position that ended high. 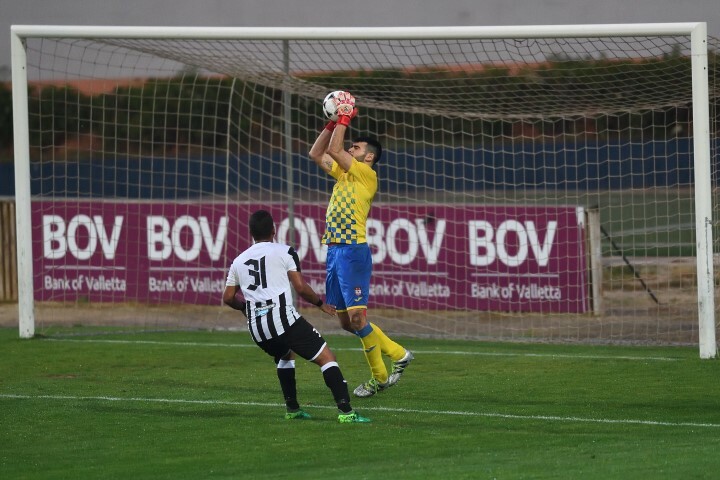 On 24 minutes Ghajnsielem’s keeper Joseph Grech was called to make a good intervention to turn to a corner a shot from an angled position by Jason Pace and three minutes later an attempt by Emiliano Lattes ended wide. 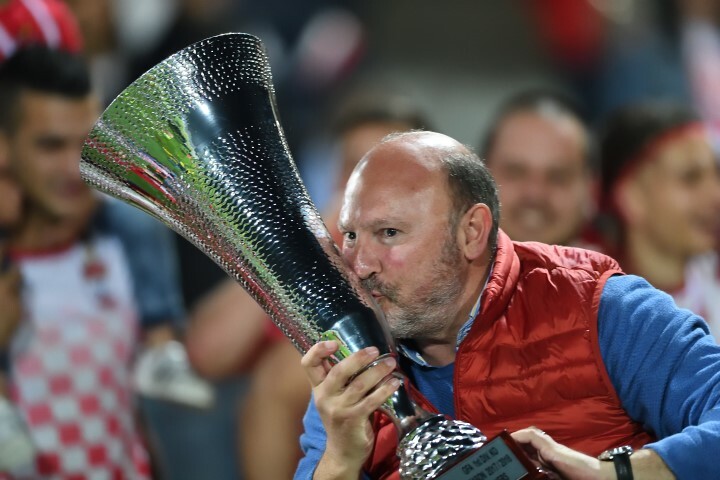 Ghajnsielem opened the score on 29 minutes through an excellent curling shot from an angled position by Marco Antonio Morgon Filho that ended out of the reach of Victoria’s keeper. The Hotspurs tried to regain territorial supremacy and on 34 minutes they went close to scoring but a first timer by Chris Camilleri following a cross by Elton Da Silva ended wide. On 45 minutes the Hotspurs went again close to level the score but a shot by Christian Mercieca following a short clearance by the defence was deflected to a corner with the goalkeeper beaten. The Hotspurs maintained their momentum after the break and on 52 minutes they operated a prolonged action inside Ghajnsielem’s area but the final shot by Emiliano Lattes was blocked by the defence. 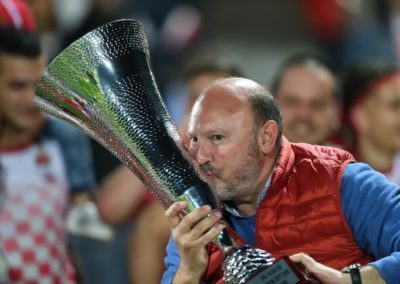 Five minutes later Victoria’s Ferdinando Apap concluded just wide form close distance following an inviting cross by Chris Camilleri and on 58 minutes Ghajnsielem replied through a shot from long distance by Alberto Xuereb that ended wide. 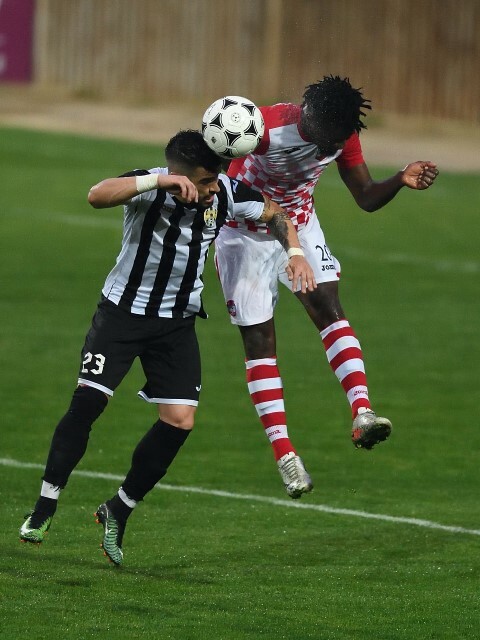 One minute later a first timer by Victoria’s Elton Da Silva who received from Dwomoh Lombas Galder missed the target and on 63 minutes an effort by Christian Mercieca following a good move by Elton Da Silva ended away from Ghajnsielem’s goal. Two minutes later Ghajnsielem’s goalie Joseph Grech was called to make a good intervention to save a shot by Chris Camilleri following a low cross by Dwomoh Lombas Galder but on 66 minutes the Hotspurs scored the equaliser when Elton Da Silva entered the area with a personal action from the right flank and from his low cross Chris Camilleri fired in goal despite the challenge from his direct opponent. 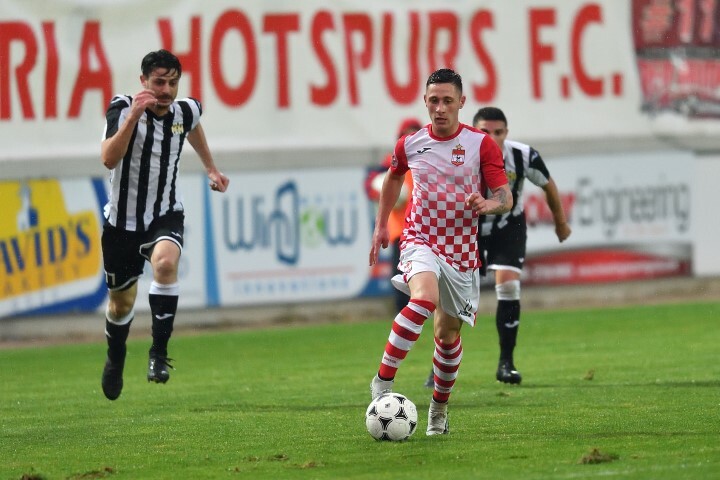 The Hotspurs turned the result in their favour on 76 minutes when Elton Da Silva released Christian Mercieca inside Ghajnsielem’s territory and the young striker lobbed over the goalkeeper who left his position in an attempt to block the danger. Ghajnsielem replied three minutes later through a personal action by Luis Andre De Melo Lima who entered the area but his shot ended on the side of the net. The Blacks had their best opportunity to level the score on 86 minutes but Alberto Xuereb’s shot-cross passed in front of Victoria’s goal without finding any striker ready for the tap-in. In the following action the Hotspurs sealed the victory with the third goal when Elton Da Silva entered the area with a personal action but his low drive hit the post. The ball arrived to Victoria’s Christian Mercieca who passed to Elton Da Silva, who was in an offside position, and the Brazilian striker concluded in goal from close distance. The goal led to strong protests by Ghajnsielem’s players for the offside position of Victoria’s scorer but the match officials kept by their decision and before the restart Ghajnsielem’s skipper Kenneth Mercieca was sent off for pushing the referee. During the remaining minutes of the match the Hotspurs controlled their lead as Ghajnsielem lost any hopes of recovering the score. 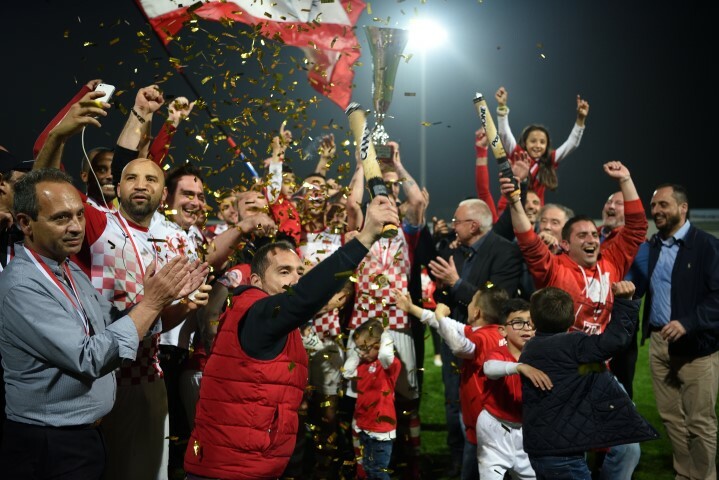 After the match the President of the Gozo Football Association Dr Samuel Azzopardi and other top GFA officials presented the medals and trophy of the Knock Out competition for the first Division to Victoria Hotspurs among the celebrations of the players, officials and supporters.